Apple says it believes coding is an essential skill and wants to teach it to students as young as kindergarten. For the next phase of its Everyone Can Code initiative, the company teamed up with STEM learning company Tynker to launch two full, free courses purpose-built for Apple’s programming language Swift. Tynker has helped more than 50 million kids around the world learn introductory coding skills through games and activities. The new courses, “Space Cadet” and “Dragon Spells,” are now available on the Tynker iPad app and incorporated into the “Swift Playgrounds: Learn to Code 1 & 2” guides available on iBooks. Both courses ask students to solve coding puzzles and complete projects that combine Tynker’s visual code blocks and the Swift programming language. The initial launch is in English, but the company said it will add Chinese, Japanese, Spanish, French and German versions by June. THE Journal spoke to Tynker’s co-founder and CTO Srinivas Mandayam to find out more about how the courses are designed to help young learners foster foundational computer science concepts. THE Journal: How do the two courses fit into Apple’s Everyone Can Code initiative? Srinivas Mandayam: As the next step in the Everyone Can Code program, Apple today announced two digital books that are complete curricula for elementary schools, allowing them to actually teach computational thinking skills and coding to kids. Tynker is featured as the coding solution in those digital books. Our partnership with Apple involves us providing the actual activities for kids to do for the entire elementary curriculum from K–5. THE Journal: Can you elaborate on how Tynker is integrated into these guidebooks? Mandayam: We worked very closely with Apple on the courses. We helped them author some chapters and they had curriculum experts and a few teachers review the materials. If you look at those books, we have about 8-10 chapters per guide, with each one addressing some specific computing concept. For example, a whole chapter is devoted to “sequencing,” which covers everything on the topic. When it’s time to put the concepts into practice, students can do corresponding exercises in the Tynker app, which now has these courses, too. THE Journal: What are teachers and students going to like about these two new courses? Mandayam: One thing about Tynker is that we’ve been at this for about four, five years now and what we’ve found is that if you try to bore kids with technical concept names, like “abstraction” and “modeling” and “algebraic thinking,” they really don’t like those kinds of things. 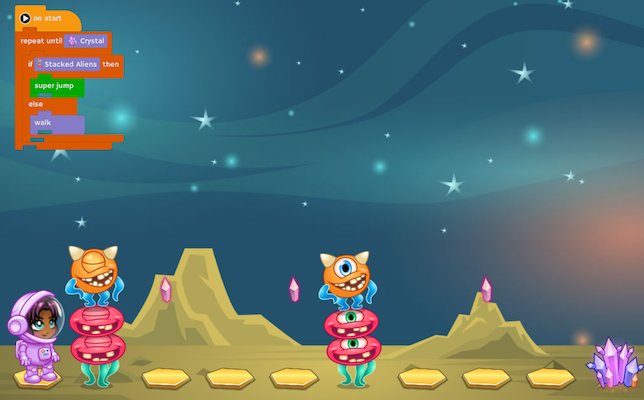 Our puzzles are all game-based, so the whole approach we use to teach is there is a problem presented and kids have to navigate through the game — going through obstacles and avoiding aliens — to get there. As they’re doing those things, they’re learning coding concepts without even realizing it. In “Space Cadets,” for example, you either choose to become Buzz or May and your character has crash landed on a planet. You need to collect items to get back home. When kids have a goal or scenario like this, which is specific to their interests, they’re more likely to be engaged with the story and want to complete the program. "Space Cadets" is pictured above. THE Journal: What kinds of foundational computer science concepts will students learn? Mandayam: Computational skills are exactly what we want the kids to learn, but they’re more abstract, like sequencing, as I mentioned earlier. What we’ve done is we’ve made [these abstract concepts] into these little puzzles where they’re actually applying those computational thinking skills. Students can learn these skills inside or outside of the classroom with the digital books. Teachers can work with kids as identified with the books without a computer [offline] and then they can practice on an iPad. 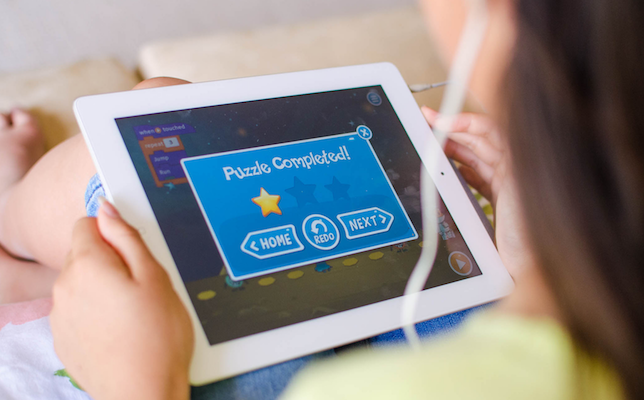 The combination of the non-coding curriculum that Apple has developed in the books and the coding puzzles that we offer in Tynker complete the picture. THE Journal: Will students practice problems alone or in groups? What kind of collaboration takes place throughout the courses? Mandayam: First of all, we have to be really careful about kids’ privacy, so we comply with a lot of privacy standards when it comes to sharing their personal information and things like that. Having said that, we have a community section in the mobile app itself. Sharing is allowed when it’s moderated. When kids decide to build a project and want [to share it with the learner community], we actually have to approve that project before it’s published, making sure there is nothing inappropriate. That happens everyday, with thousands of projects being published. Inside the classroom in-person, a lot of collaboration is happening as well. Teachers often have rules like “ask three before me” and others where they want to collaborate with each other, and that’s an option with these courses. There’s a deep level of analytics and recording presented on the platform. To learn more about the new courses, watch the video below or visit the Tynker site.